Rabcat and Microgaming have added another slot to their portfolio with the release of Crystal Rift. 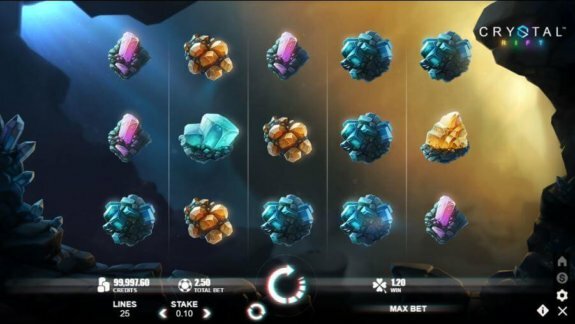 The slot offers an interesting mining concept with engaging features and mechanisms. It is a great addition to the slot world, featuring 5 reels and 25 paylines. The game play offers you a chance to uncover hidden treasures as you attempt to win the jackpot of $50,000. Why Crystal Rift? During gameplay, the game symbols will drop to fill a 5X3 grid. There are different grid designs that provide greater chances of scoring bigger wins. Your first impression of this slot will be highly favorable as it is evident that the producer took time to make it as appealing as possible. There are 8 different rock symbols available and each grid design has different symbols and patterns. You start with the basic and attempt to advance all the way up to the insane grid. The higher the grid, the better chances you have of winning the jackpot. Just like any other game, you need to land a winning combination to get a payout. The game provides wild symbols, which are represented by a Diamond cube. Even though the game doesn’t have a traditional concept, the wild still acts as a replacement for any other symbol. You need to get at least 3 diamond cubes in consecutive positions to win. The grids change every time you start a new round of play. 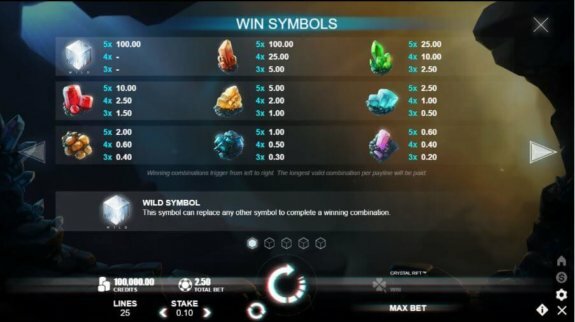 The developers have made it easy to identify winning combinations by highlighting the matching sequence followed by the symbols exploding in place. Everything about the game, from the visuals to the gems and crystals make you feel like you are in a cave. The sound effects fit the theme perfectly and add to the variety. There are many mining themed slots about, but Crystal rift takes things to a whole new level. 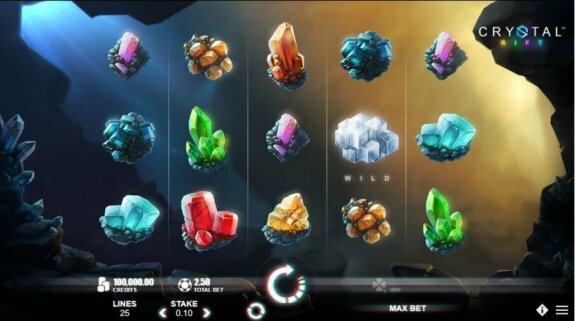 Crystal Rift features eight regular symbols and one wild. The eight regular symbols feature a different crystal and you can easily spot them based on their color. Each symbol has a different value. In terms of their worth, they range from highest to lowest in the following order: orange, green, red, amber, light blue, brown, dark blue and pink. The wins start off relatively small, but as you move through the grids you have the possibility of winning some massive payouts. You can win any amount above your bet if you get at least four consecutive symbols along an active payline. There is the wild grid bonus which turns small wins into massive ones. The wild grid features will become active during play if you manage to get three successive wins. Once it is active, every symbol within the wild grid that drops during a game will feature a wild. This makes the game more engaging as you progress from one stage to another. With this type of feature, you can easily see why the game continues to receive a lot of popularity. It has lucrative combinations that make it easy for players to progress through the game while maintaining the same level of thrill throughout. Play Crystal Rift for free! Landing the wild produces a multiplier on your bet. You will win the jackpot if you manage to get five of the wilds along an active line. If this occurs, you will also get up to 1000x your original wager. In other words, the wild can get you a good payout as well as the jackpot. The game does not have scatter symbols as the wild grid replaces this feature. Players usually get worried when a game does not offer scatter symbols, but you shouldn’t in this case. The wild grid is an innovative way of creating more winning opportunities, so it makes up for the lack of a scatter symbol. There is a bonus fall feature which happens when you get a winning combination. The winning symbols disappear and new ones appear, continuing the winning cycle until no more combinations are available. The fact that Crystal Rift is not a traditional slot game makes its bonus features even more exciting. You shouldn’t be in a rush to score big when playing this slot. You should start with the lowest wager set at $0.25 for each round and increase it as you progress. With time, if you like, you can set it at the maximum which is $50.00. These are some of the important tips you need to consider before you enjoy this new addition to the gaming world. Consider the following tips below before you start to play. * Play for free as often as possible so that you master how to play the game. * Make use of any available offers before you use your own money. This will ensure that you minimise your own loses before you can understand the game fully. * Understand the slot before playing. Without a good understanding of the slot game, you can never win big. Crystal Rift is an impressive slot game that provides players with numerous winning opportunities. Apart from the stunning crystals, it has a straightforward game play and appealing theme. Its RTP of 96% is enough motivation to get any player interested in this game. It is compatible with mobile devices, and provides the same unique experience. The wild grid feature and bonus fall provide an in-depth approach to modern gaming.